The winter issue of the Society of Environmental Journalists magazine features a Q&A with Circle of Blue director, J. Carl Ganter. As part of SEJournal’s look at the future of nonprofit news services, our “Inside Story” editor Beth Daley spoke with J. Carl Ganter, director of Circle of Blue, a team of journalists and researchers headquartered in Michigan that reports on the global intersection of water, food, and energy. 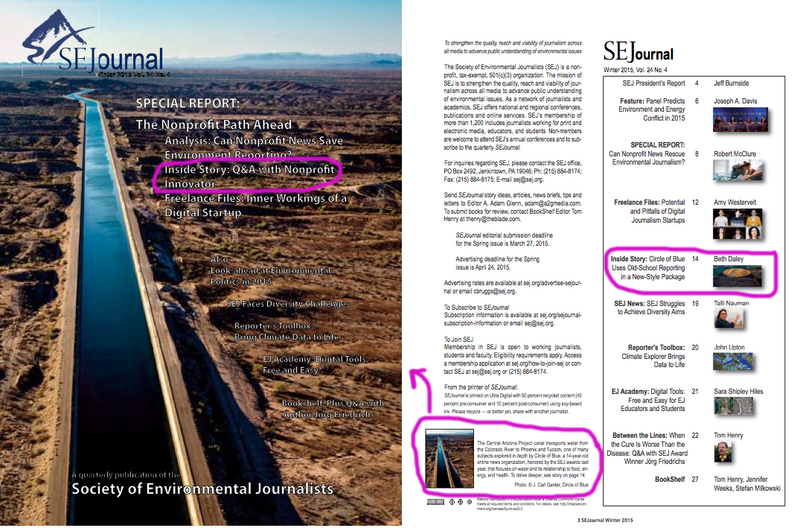 The nonprofit recently won two recognitions in SEJ’s 13th annual awards — a second-place award for Ganter, Matt Black and Brian Lehmann’s evocative, intimate images of the world’s quest for water, and a third-place prize for reporter Brett Walton’s timely, clear writing on competing interests for water in three Western states. Ganter, whose photography and reporting has appeared across media including TIME, National Geographic, Rolling Stone, NBC5 and public radio, co-founded the news group in 2000. He’s a Northwestern graduate and was part of a team that broke the first story in the series of wrongful conviction cases investigated by Medill students. He also taught multimedia bootcamps for eight years at the Poynter Institute. Since then, he received the Rockefeller Foundation’s Centennial Innovation Award in 2012 and is a member of the World Economic Forum’s Global Agenda Council on Water. SEJournal: When did Circle of Blue launch and why? J. Carl Ganter: When our daughter was born 14 years ago, my wife, Eileen, and I wondered what the world would be like for her generation. We asked ourselves what would be the big story of her lifetime, what could we do to help inform some of the most important decisions of her time. Our first grant came from the Ford Foundation in 2006 to do a multimedia project in Mexico. We wanted to show how one community, Tehuacan, was a crucible for the fast- emerging global water crisis. We brought in World Press-winning photojournalist Brent Stirton and Newsweek cover writer Joe Contreras. We peeled back the layers of an intensely complicated issue and the results were published by nearly every major Mexico news outlet. We proved our capabilities to cover tough stories — in-depth, and fast. SEJournal: From where does your funding come? Ganter: Circle of Blue is an independent, nonprofit affiliate of the Pacific Institute, a California-based think tank on climate and water. Our funders include the Rockefeller Foundation, the David and Lucile Packard Foundation, the William and Flora Hewlett Foundation, Energy Foundation, and the Charles Stewart Mott Foundation. SEJournal: Describe Circle of Blue’s mission and goals. Ganter: Our core coverage is water and the competition between water, food and energy. These are the planet’s big stories, and they are fiercely complicated. They aren’t just a click away. We believe in old-school reporting, which we call, “IWT,” I Was There. You have to go to the mines of Inner Mongolia or the fields of Punjab to dig out the stories, capture the data, and show the context. Then we physically convene around our findings. For example, in China we sent four teams across the country and found that the country doesn’t have enough water to continue mining and processing coal. This is likely the largest threat to its GDP. We partnered with the Wilson Center, a nonpartisan think tank and convening center in Washington, for research and presentations. Together, we did 17 sessions across China, from presentations for the China Minister of Water to the U.S. Embassy to the Yellow River Commission. SEJournal: How many staff members do you have, i.e., how many editors, reporters, etc.? Ganter: We have a core team of eight people and ramp up for major projects. For example, we had about 40 working on the Choke Point: China project. This included photojournalists, reporters, edi- tors, designers, interns from Northwestern’s Medill School of Journalism, and graduate students in design at Ball State University. SEJournal: How do you keep your reputation as an objective, unbiased organization? Ganter: We avoid the term “advocacy journalism,” but of course, I’m pro-water. It’s imperative for us to maintain and protect our trust, credibility and objectivity. Our reporting is crisp, we ask tough questions, and we do what good journalism is designed to do: reveal new ideas, present unbiased accounts, and compel informed response. SEJournal: When is a nonprofit journalism venture such as Circle of Blue able to call itself sustainable? Ganter: I would bet that most nonprofit journalism organizations face a continual sustainability challenge. It’s hard to build an endowment, and it’s difficult to be cumulative with the way most foundations operate. The big questions that worry me are: Can philanthropy keep up? Can nonprofit funders support the work necessary to inform our generation’s most urgent, important decisions? Will foundations and philanthropists continue to value great (and often costly) reporting when the world is filled with clutter and shallow streams of dubious information? Funding has to be systemic and as persistent as the challenges. For our big take-outs, we assemble several funders, and in parallel raise support for daily reporting and operations. Funders need to understand these issues are complicated, they are not a click away, you have to be persistent, and you have to be on the ground to do the real work. Considering the gravity of the global situation, it’s important to stay focused and not go down rabbit holes of meaningless stories. Aggregation, Twitter streams, stock photos, and crowd-sourcing alone don’t provide an accurate picture. In some cases, we’ve accepted funding from companies, but are very careful to maintain independence. SEJournal: What can nonprofit journalism accomplish that traditional journalism cannot? Ganter: For us, we’ve been able to be laser-focused on what we feel is the biggest ongoing story of our careers. 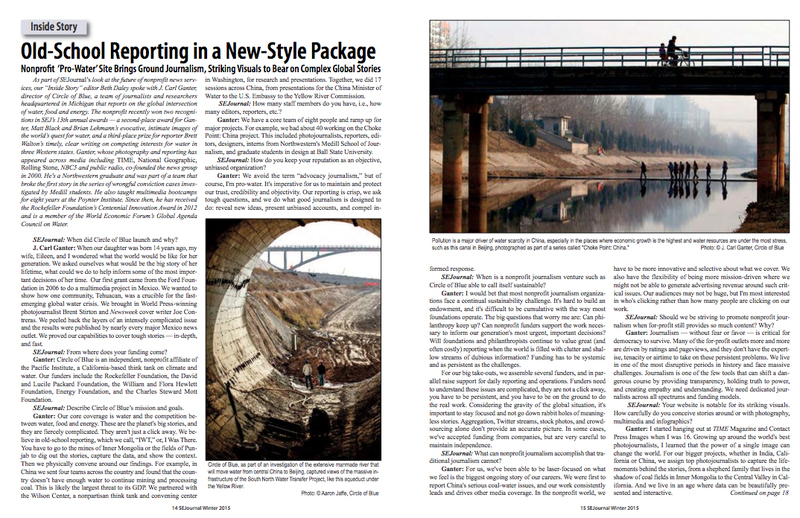 We were first to report China’s serious coal-water issues, and our work consistently leads and drives other media coverage. In the nonprofit world, we have to be more innovative and selective about what we cover. We also have the flexibility of being more mission-driven where we might not be able to generate advertising revenue around such critical issues. Our audiences may not be huge, but I’m most interested in who’s clicking rather than how many people are clicking on our work. SEJournal: Should we be striving to promote nonprofit journalism when for-profit still provides so much content? Why? Ganter: Journalism — without fear or favor — is critical for democracy to survive. Many of the for-profit outlets more and more are driven by ratings and pageviews, and they don’t have the expertise, tenacity or airtime to take on these persistent problems. We live in one of the most disruptive periods in history and face massive challenges. Journalism is one of the few tools that can shift a dangerous course by providing transparency, holding truth to power, and creating empathy and understanding. We need dedicated journalists across all spectrums and funding models. SEJournal: Your website is notable for its striking visuals. How carefully do you conceive stories around or with photography, multimedia and infographics? Ganter: I started hanging out at TIME Magazine and Contact Press Images when I was 16. Growing up around the world’s best photojournalists, I learned that the power of a single image can change the world. For our bigger projects, whether in India, California or China, we assign top photojournalists to capture the life-moments behind the stories, from a shepherd family that lives in the shadow of coal fields in Inner Mongolia to the Central Valley in California. And we live in an age where data can be beautifully presented and interactive. SEJournal: How do you choose what to cover? Ganter: We listen hard for emerging trends. We cover news every day and try to connect the dots. We think systemically and are intensely curious — if a story is emerging in China, we wonder how it will affect mining investments in Australia. We also use our own Twitter feed to curate headlines and what we think is important. Last summer we published Choke Point: Index, an in-depth look at the U.S. water and agriculture challenges. These stories came from on-the-ground reporting and listening hard for the most important angles. SEJournal: What would you consider the most underreported water stories journalists are not pursuing? Ganter: Water affects everything and it’s easy to drown in information and miss the connections. You have to pick a place to start reporting and apply the rules of solid journalism — make it personal, ask the usual questions about heroes, victims and villains, and follow the money. For a global story, water is also the most local. If you are a local reporter or a beat reporter and want to cover water, learn about local pollution issues, Superfund sites, ground water use and quality, and infrastructure investments. There are inspiring features to be written and hard-hitting investigations. SEJournal: What advice would you give reporters to pursue these stories? Ganter: Water — or any of these big resource issues — can’t be reported in a single story. These issues are ongoing and require persistence, tenacity, and creativity. It’s disappointing to see that the typical environmental beat has faded from most traditional news outlets. It takes collective knowledge and experience to make the big stories of our time — water, climate, energy, agriculture — relevant, personal and valuable. 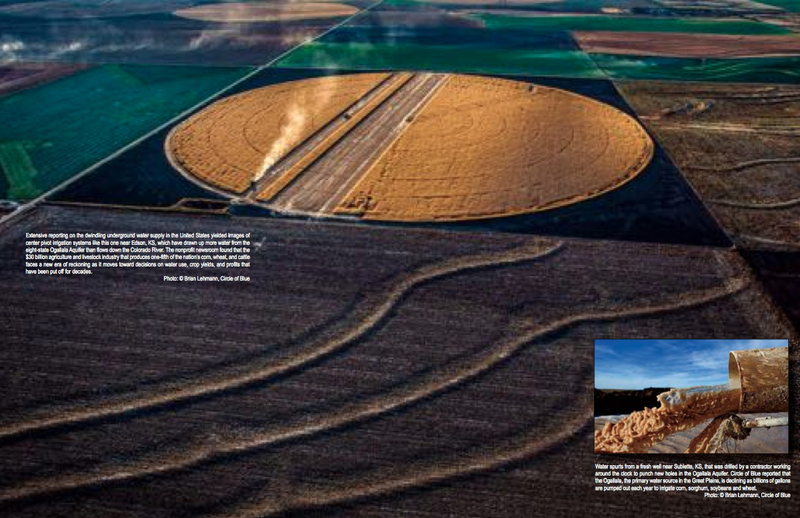 All images courtesy of SEJournal Winter 2015. An interview with Circle of Blue director J. Carl Ganter was the featured cover story of SEJournal Winter 2015. 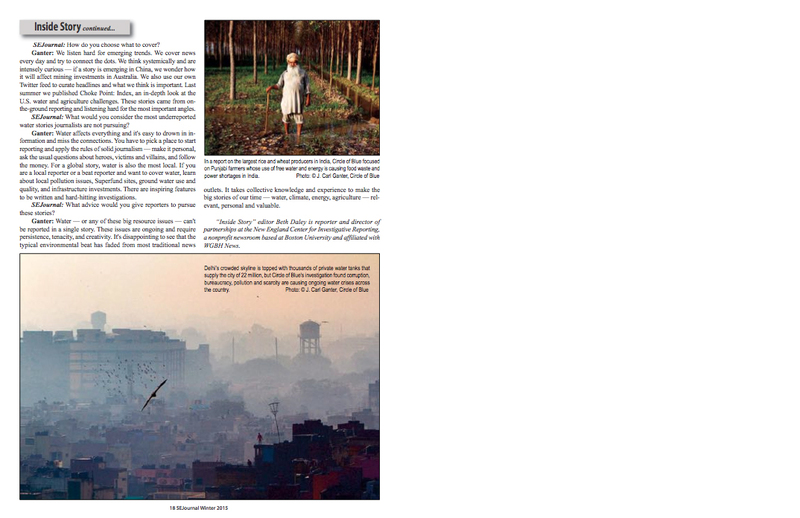 Click images to enlarge the spread or click here to read the PDF. Beth Daley is a reporter and director of partnerships at the New England Center for Investigative Reporting, a nonprofit newsroom that is based at Boston University and affiliated with WGBH News. Daley interviewed Circle of Blue director J. Carl Ganter and produced this Q&A for the SEJournal Winter 2015, Vol. 24 No. 4. Photos by Ganter, photographer/reporter Aaron Jaffe, and photojournalist Brian Lehmann, were featured in the piece, as well Ganter’s image of the Central Arizona Project canal system on the cover.